With the recent high pressure system bringing hot, dry weather to Scotland, we at last managed to string a few trips together and gradually build up some form. 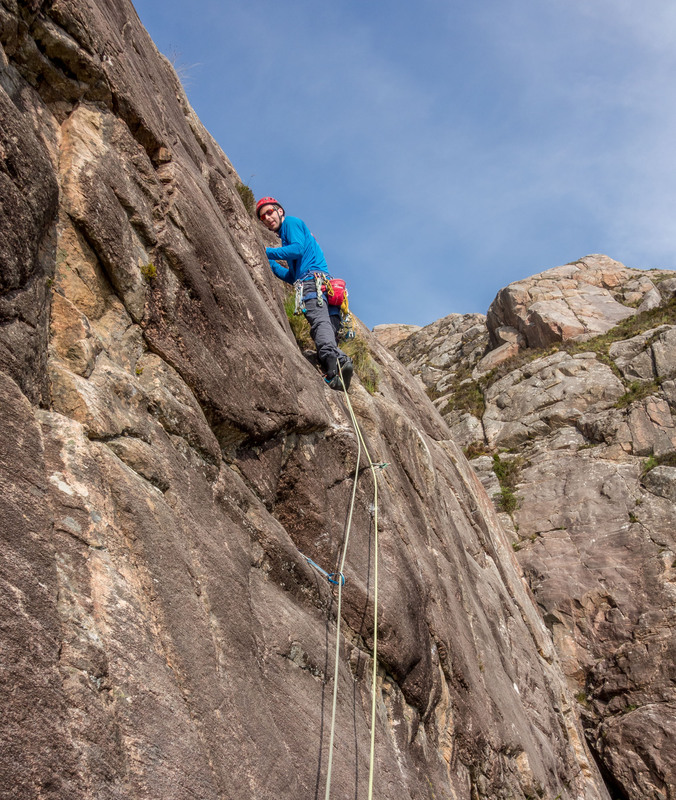 The mountains were calling but having enjoyed a good run of cragging with trips to Glen Nevis and Reiff, we decided to keep the momentum going and sample the excellent outcrops in Glen Torridon and Diabaig. An afternoon tasting menu at Seana Mheallan whetted the appetite nicely. We aimed too low however and apart from the superb Rowantree Crack (HVS) we didn’t think much of the VS’s. 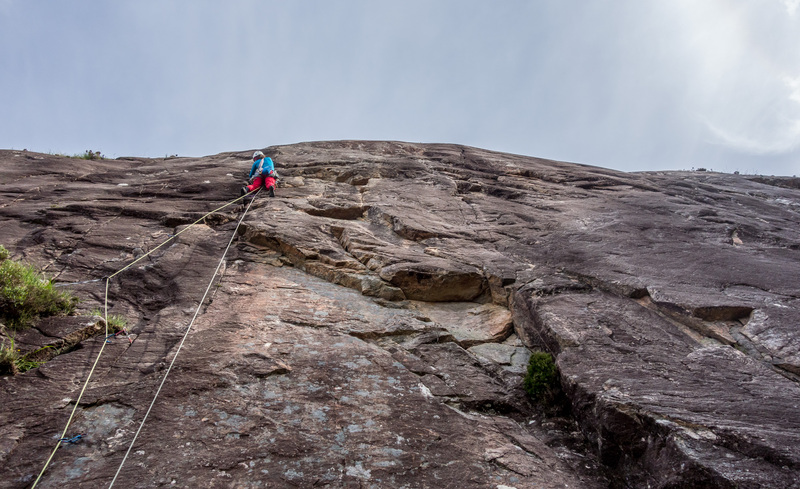 The crag appears to come into it’s own at HVS and above with some outstanding looking lines. 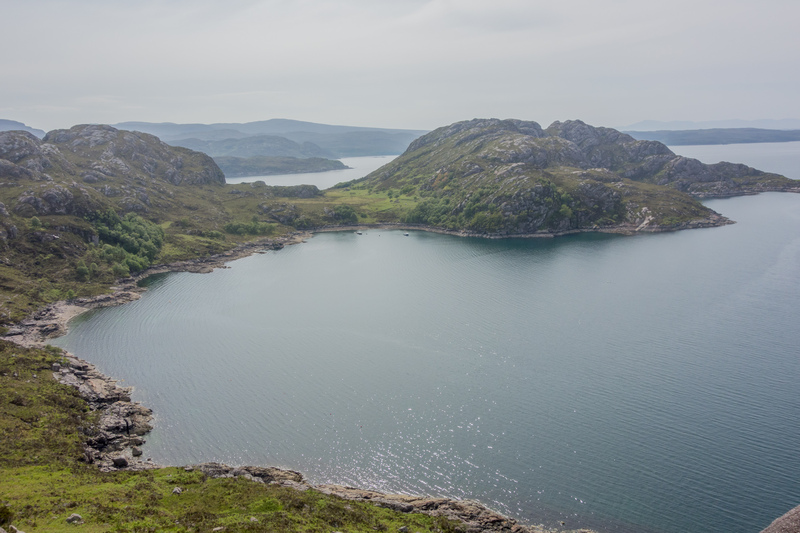 The next day in soaring temperatures we drove to the end of the road and the mega-crag of Diabaig’s Main Wall. 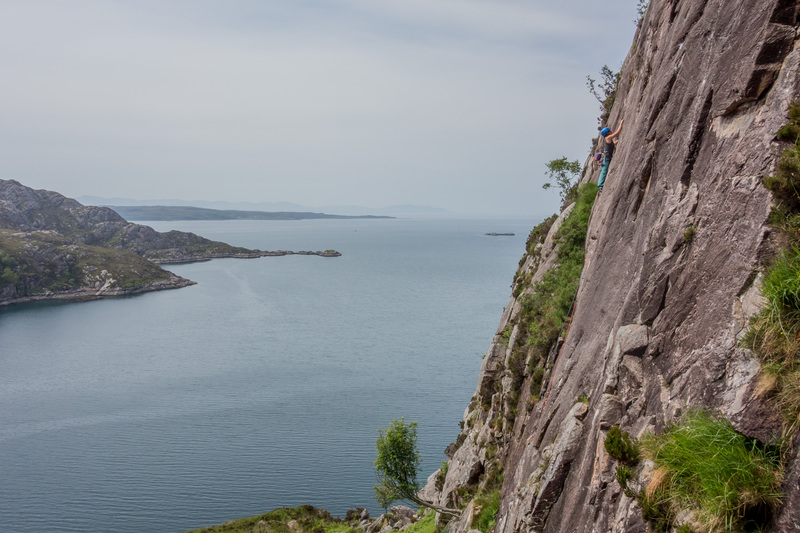 This 70 m high cliff of Lewisian Gneiss is reputed to harbour some of the best outcrop climbing in the NW Highlands and it didn’t disappoint! First up was the classic Route Two, a sustained HVS which the guide describes as a good introduction to the cliff. 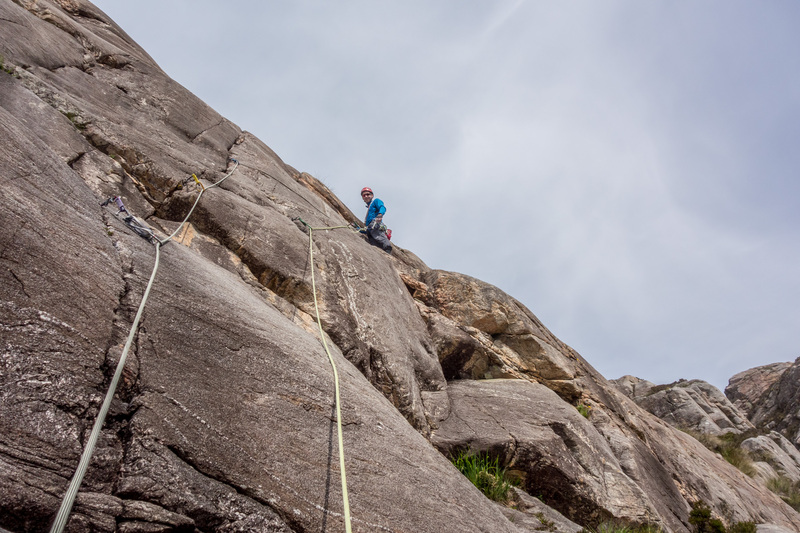 It wasn’t lying – Debs and I both agreed this was one of the best outcrop routes we had ever climbed and worth every star! Flying high on Route Two and loving every second of it! 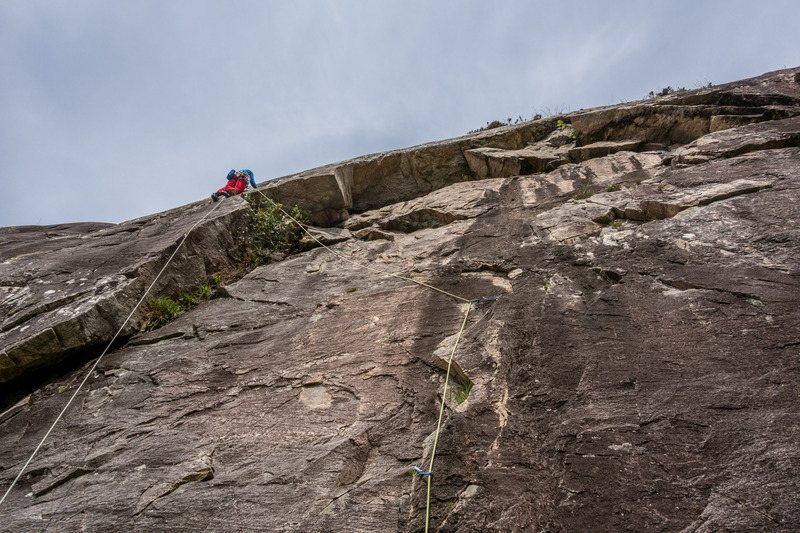 Next up was Route One which offered something a bit different on it’s first pitch – a flake crack leading to a roof guarded by an inconvenient holly tree! 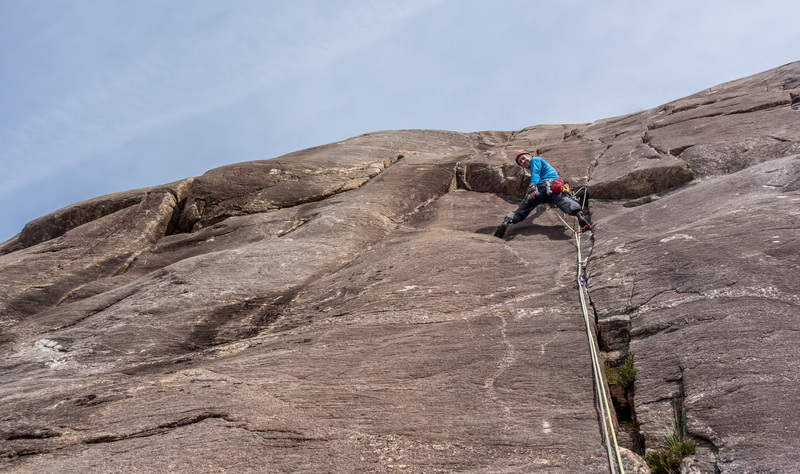 A stiff pull onto the slab above led to more cracked slabs and some respite at the belay ledge. 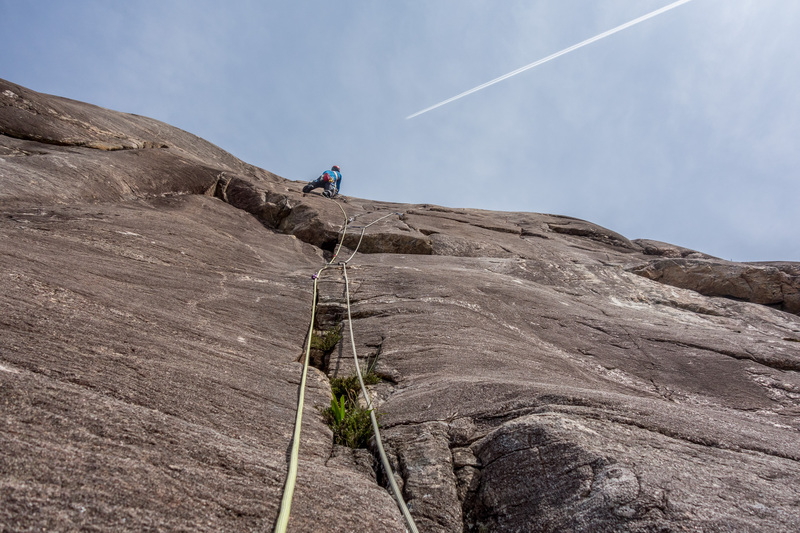 Another perspective on the first pitch of Route Two as a leader romps up the route. Not an unpleasant place to climb this! The heat was starting to take it’s toll but with just enough left in the tank we jumped on, yup, you guessed it, Route Three (E1). 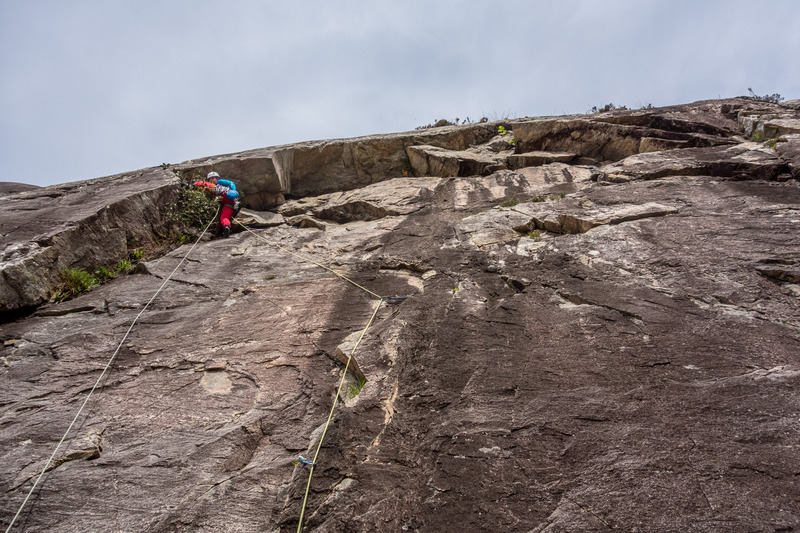 An entry pitch deposited us on the heather ledge and I embarked upon the first technical climbing – a series of sloping 5b moves into a ramp. Balanced on the ramp after the bouldery start to pitch 2 of Route Three and feeling wasted in the baking heat! 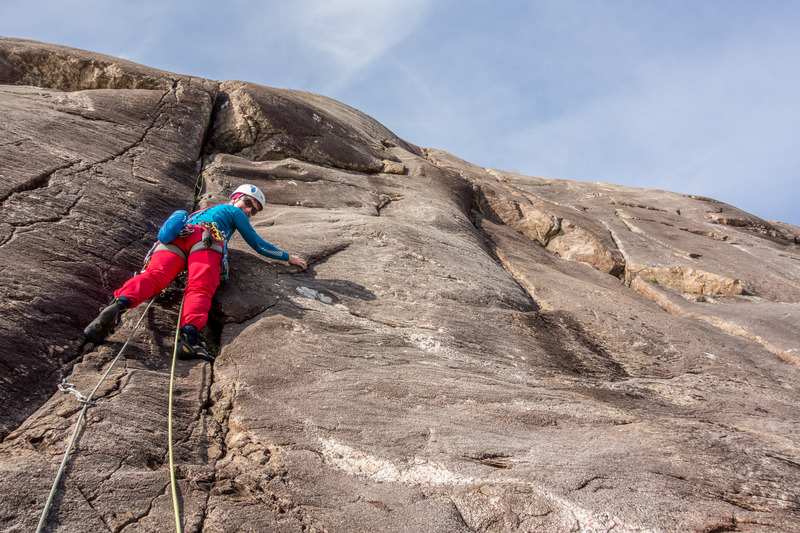 The final pitch was stunning though, despite the cooking and the semi-hanging belay. Debs forged up the crack and after a quick pep talk set about the battle of the bulge, jamming her way to victory! The next day we toiled halfway up the south side of Liathach for a spot of Torridonian esoterica on the picturesque Path Crag. A series of burly cracks and gravely offwidths followed with more than the odd sandbagged grade. The highlight coming from the unlikely-looking Spaceman (HVS), which is more than worth the trip up for!